Driving into Tegucigalpa to observe Honduras’s November 24 presidential election, our 17-member National Lawyers Guild delegation searched in vain for billboards featuring Xiomara Castro, candidate of the LIBRE (Freedom and Refoundation) party and wife of former President Mel Zelaya, ousted in a 2009 coup. Instead, Juan Orlando Hernández, candidate of the well-heeled ruling National Party—with whom Castro ran neck-and-neck in the pre-election polls—greeted us from virtually every inch of costly advertising space. It was an early sign of the extreme disparities of wealth and power that cast a long shadow over the election, creating formidable—and likely insurmountable—obstacles for the fledgling anti-coup resistance party in its first venture into national politics. 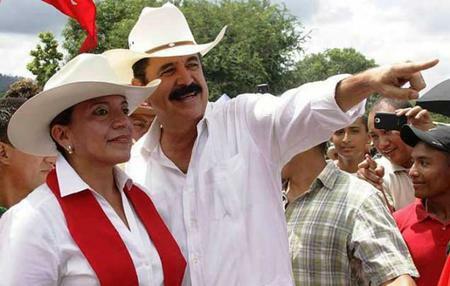 Xiomara Castro and Mel Zelaya. Credit: lr21.comAccording to the Supreme Electoral Tribunal (TSE), Hernández won the presidency with 37% of the vote, well ahead of Castro at 29% and the Liberal Party candidate at 20%. (Honduran election law does not provide for a runoff if no candidate wins a majority.) But LIBRE, together with the libertarian Anti-Corruption Party (PAC) which received 14% of the vote, has refused to recognize the official results, denouncing an “electoral fraud of incalculable proportions.” Following a massive protest march last Sunday, the TSE agreed to a partial public recount. As international observers, we were impressed by the high level of civic engagement exhibited by the Honduran people, and by the progress that has been achieved towards creating a more transparent and accountable electoral system in a society with fragile democratic institutions. But these advances were far outweighed—and indeed subverted—by the circumstances of concentrated power, militarization, and targeted repression in which the election occurred, creating opportunities for electoral abuse and compromising the integrity of the process long before voters arrived at the polls. Voting line in El Reparto barrio. Credit: Emily Achtenberg. On Election Day, we witnessed extraordinary efforts by ordinary Hondurans to make their votes count. More than 61% of 5.3 million eligible voters turned out at 5,400 voting centers nationwide. Many persisted against the odds, waiting 2-3 hours in line at overcrowded, under-resourced polling stations in impoverished barrios. At one such school facility in Tegucigalpa, we saw family members and volunteers virtually carrying elderly and handicapped voters up three steep flights of narrow stairs, and improvising creative directional systems to help voters through the complex labyrinth of classrooms to find their tables. Still, with voters entering and exiting the building confined to a single narrow doorway, many in this neighborhood—described to us as a LIBRE stronghold—may have concluded that the obstacles to exercising their vote were just too great. Honduras made important advances in this election towards implementing a universal voter registration system for citizens aged 18 and over. Voter ID cards, previously distributed by the political parties, were issued directly by mobile Registry brigades (a U.S.-funded initiative). Yet, members of our delegation heard voters complain that their dead or emigrated relatives still appeared on the Registry, or that they themselves could not vote because their names were not listed. European Union (EU) observers found that up to 30% of the Registry entries were invalid. Voters in this election had a choice of eight presidential candidates and nine parties, marking a sharp departure from the two-party (National and Liberal) system which has dominated Honduras for a century. But beyond the strong showings for LIBRE and PAC, the five smaller parties turned out to be largely shams, helping to perpetuate dominant party control of the voting system by trafficking their polling table credentials to the National Party (while their existence greatly increased the complexity and cost of the election). TSE officials advised us that they allocated an equal number of blank credential documents to each party, but could not control what the parties did with them later. This practice, which has been strongly criticized by the EU and the OAS, allowed the National Party to consolidate control over the voting tables where critical decisions (such as whether a voter is eligible to vote, or how to count a ballot) are made by majority vote. Discount cards offered by National Party candidate Hernández. 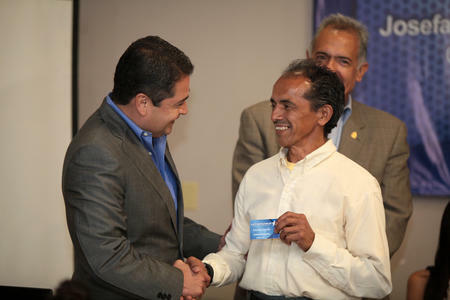 Credit: laprensa.hn Members of our delegation saw the popular National Party discount card—another mechanism used to influence the electoral outcome—being offered to voters at party tents outside polling places. The card, which lowers the cost of groceries, pharmaceuticals, cell phone plans, and other goods and services, reportedly identifies the bearer as a National Party member and is good for four years. Whether or not this constitutes bribery, the International Federation of Human Rights (FIDH) calls it a hidden campaign financing source which may directly violate Honduran election laws, for businesses having contracts with the government. The election featured significant technological advances, including a much-vaunted electronic transmission system which allowed each table’s hand-counted voting tallies to be scanned directly to a centralized TSE database. This was a vast improvement over the past practice of calling in the results by cell phone, but also introduced new levels of problems. Some 600 voting centers (more than 10%) lacked the electricity or internet connections required for scanning. Then, the TSE’s published voting results for some tables turned out not to match the scanned tallies, often—but not always—reflecting an undercount for LIBRE or PAC. This was not surprising to us, having watched hundreds of TSE recruits transcribing the scanned tallies into the database late into the night after the election, in a process that left considerable room for error, if not abuse. An independent, non-partisan review of the database by a group of concerned citizens has sought to reconcile these inconsistencies. While their analysis leaves the candidates in the same relative position, it also confirms significant flaws in the TSE software—underscored by Honduras Anonymous’s recent hackings into the system. Thus far, the TSE has only agreed to a public recount of the tally sheets (not the votes), which will contrast the original, scanned, and LIBRE party versions. LIBRE is demanding, at a minimum, that where inconsistencies are found, the ballots should be recounted vote by vote. As of now, the recount process remains unresolved. The final election results must be certified by December 24. The post-coup military’s outsized role in Honduras, enhanced even more during the elections, was disturbingly evident to our observer team. Charged under the Constitution with safeguarding the vote and the ballot boxes, soldiers with M-16 machine guns were highly visible at every polling station, even controlling logistics and voter access at some locations. With Honduras having the highest homicide rate in the world (at 20 murders per day), the choice between Hernández’s mano dura initiatives to militarize domestic police functions—in violation of the Constitution—and Castro’s advocacy of community policing was a central issue during the electoral campaign. Manipulative messaging by the ruling National Party, disseminated through the state-dominated media, may have been effective in swaying fearful voters to Hernández on this issue. Still, the beefed-up military presence (which is heavily U.S.-financed) has not succeeded in halting drug trafficking in Honduras, but has bolstered large landholders and businesses in their efforts to suppress popular resistance to corporate land grabs. Especially in the electoral context, militarization—by the very forces that were instrumental in carrying out the 2009 coup—has created a climate of intimidation that discourages the exercise of civil liberties. The climate of repression, politically-targeted violence, and impunity in post-coup Honduras that has intensified during the run-up to the election has been well documented. At least 22 LIBRE candidates, activists, and supporters have been murdered since May 2012, including two on election eve and one in the days just after the Credit: Emily Achtenbergelection. Two days before the vote, the LIBRE headquarters in Tegucigalpa was surrounded by masked men with guns, alleged to be military police. Human rights organizations have catalogued gross violations particularly targeting indigenous groups, campesinos, lawyers, journalists, LGBT community members, and other opponents of the regime. Most of these crimes have gone unpunished. The newly-appointed Special Prosecutor for Human Rights told our delegation that she faces a backlog of 7,500 cases. Meanwhile, indigenous leader Bertha Cáceres, currently facing criminal charges for her role in resisting a hydroelectric dam megaproject, gave us a copy of a paramilitary “hit list” targeting 18 activists, with her name at the top. Regardless of how the final numbers pan out, in the context of these broader forces at work in Honduras to preclude the possibility of a “free and fair election,” it is fair to say that the vote was compromised, if not manipulated or outright stolen. Solidarity organizations are calling on the U.S. State Department to not formally recognize the electoral results until all allegations of fraud and violence are fully investigated.